This is the best sporty compact car for you if you’re looking for a budget-friendly alternative to the Mazda 3 or Volkswagen Golf GTI. Fully redesigned for model-year 2018, the Elantra GT is a hatchback companion to Hyundai’s Elantra sedan, although aside from the name and some drivetrain components, the two cars are unrelated. Both are available in many worldwide markets, but the sedan is designed primarily for North American tastes. The GT is a product of the South Korean automaker’s European division, where it’s sold as the i30. And it provides a very different driving experience from the sedan. As small-car buyers increasingly turn to subcompact and compact crossovers, sales of compact cars continue to decline, although there is improved demand for small hatchbacks. 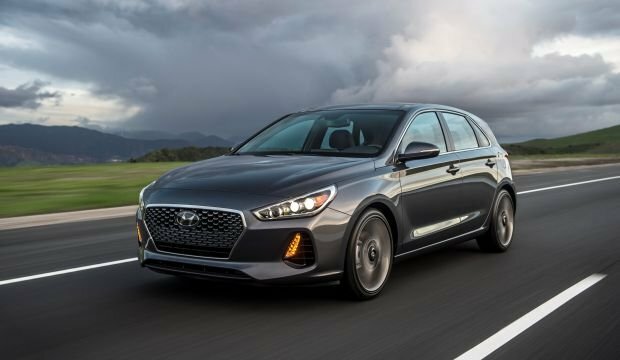 Hyundai doesn’t separate hatchback and sedan sales, but Elantra is one of the few cars of any stripe to register sales growth in 2018. Its sales are up 2.1 percent through February. The only other car in its class to see sales rise is the Nissan Sentra, with an 18.4 percent bump. 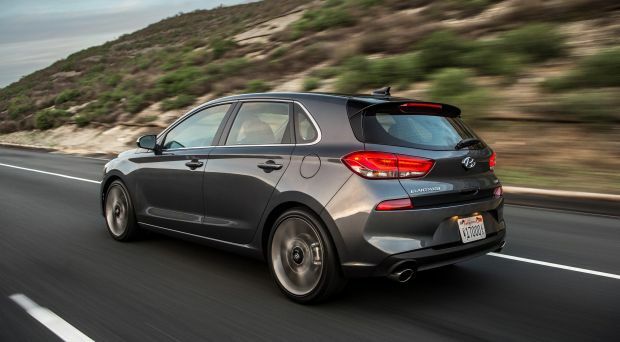 Elantra ranks fourth in the segment, behind the Civic, Toyota Corolla, and Sentra, and ahead of such nameplates as the Chevrolet Cruze and Ford Focus. In this class, hatchback body styles are offered by the Civic, Focus, Cruze, Mazda 3, Subaru Impreza, Golf, and as the Corolla iM. Kia, Hyundai’s corporate partner, also sells a hatchback version of its Forte compact as the Forte5. There’s an outside chance Hyundai might make driver-assistance features available on additional Elantra GT trim levels for 2019, but we wouldn’t delay a purchase based on that possibility. Expect the 2018 Elantra GT’s two-model lineup to carry over for 2019 and again consist of the entry-level Base and high-performance Sport. Both are front-wheel drive and come standard with a four-cylinder engine and manual transmission, with an optional automatic. Hyundai is likely to raise prices for 2019, meaning you’d be asked to pay more for a fundamentally unchanged car. The 2018 edition represents this car’s third design generation. The first went on sale in Europe and Australia in 2007, arriving Stateside in 2009 as the Elantra Touring station wagon. The second-generation, a true hatchback, adopted the Elantra GT name and arrived in the US for the 2013 model year. Styling: The Elantra GT’s European design is most obvious on its front end. While the grille shares the same general look as Hyundai’s 2018 Sonata sedan, the hatchback’s flared gills and headlights that sweep over the front fenders are Euro-centric cues. The sweeping windshield and prominent cut lines on the doors give the GT a sleek, contemporary look. Despite very thick rear roof pillars, visibility is surprisingly good. Blind-spot alert with rear cross-traffic detection is standard on the Sport and available on Base models with automatic transmission. Passenger room is about average for a compact hatchback. Legroom is decent in front, cramped in back. Comfort isn’t helped by a rear seat cushion set quite low and, combined with a high beltline, you feel more submerged than in other small hatchbacks, such as the VW Golf. Cargo capacity is a high point. There’s nearly 25 cubic feet with the rear seatbacks raised and more than 55 with them lowered. This bests the Golf and hatchback versions of the Chevrolet Cruze, Ford Focus, Honda Civic, and Mazda 3. Additionally, generously sized door pockets, center console, and glovebox provide plenty of space for small items. Instrumentation consists of Hyundai’s usual clean, easy-to-read gauges and central information screen. Interior materials are fine for a compact car. Red contrast piping lends a sporty look, but the overall ambiance is a step behind that of the Mazda 3 or Golf. Dual-zone automatic climate control is standard on the Sport and optional on the automatic-transmission Base. Its dials and buttons are logically arrayed under the infotainment screen. All GT models include a large, colorful 8-inch display. You’ll have to decide whether its trendy tablet-like mounting atop the dashboard is preferable to a screen fully integrated with the dashboard, as on the Elantra sedan. Still, the interface is easy to negotiate and quick to respond to user input. Apple CarPlay, Google Android Auto, and satellite radio are standard. Mechanical: Base-model GTs borrow their engine and transmission from the Elantra sedan. They use a 2.0-liter four-cylinder with 161 horsepower and 150 pound-feet of torque. It pairs with a standard 6-speed manual or optional 6-speed automatic transmission. The Elantra GT Sport uses a high-output version of the 1.6-liter turbocharged four-cylinder from Hyundai’s Tucson compact crossover SUV. It produces 201 horsepower and 195 pound-feet of torque. The standard transmission is a 6-speed manual. Optional is a 7-speed dual-clutch automatic. We haven’t yet tested an Elantra GT Base model, but the turbocharged Sport doesn’t feel as fast as its horsepower and torque ratings would suggest. Blame a curb weight of more than 3,000 pounds, a bit porky for the torque on hand. Fortunately, the manual transmission is Hyundai’s best ever, with very positive shift action. The clutch pedal is firm, but smooth and easy to modulate so it’s not a hassle to drive in heavy city traffic. While we have not evaluated an Elantra GT with the dual-clutch automatic, we hope it’s better than we’ve experienced in the Tucson, a vehicle that frequently suffered from low-speed bogging and juddering. The Elantra GT Base model has a prosaic torsion-beam rear suspension and 17-inch wheels and tires. The Sport has a fully independent suspension and 18-inch rolling stock. It handles well, with good grip and little body lean in fast turns. We’re pleasantly surprised by the steering: it’s meaty and direct, with none of the vagueness that we’ve criticized in other Hyundai vehicles. Still, road manners don’t match the precision feel of a Civic Sport or Si, a Mazda 3, a GTI, but the gap is closer than you might expect. Ride quality is firm, but the Elantra GT Sport takes bumps as a unit with no unwanted secondary suspension motions. 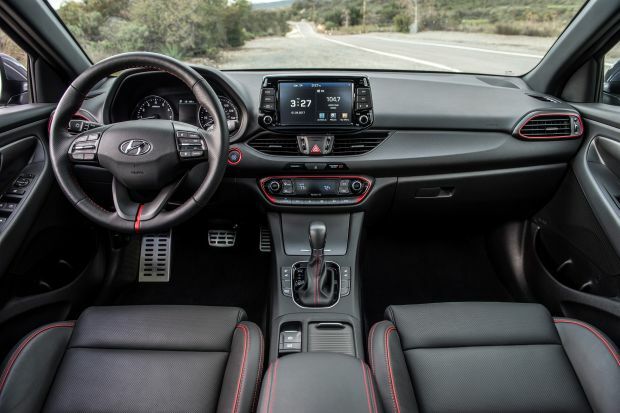 Features: Base Elantra GT models come with level of equipment expected in a compact hatchback, including power windows and locks, remote entry, and Bluetooth connectivity. Automatic headlights, 8-inch infotainment system with CarPlay and Android Auto, and a cargo cover are nice standard amenities as well. In addition to the upgraded powertrain and running gear, Sport models add blind-spot alert with rear cross-traffic detection, full LED headlights, electronic parking brake, keyless access with pushbutton ignition, leather upholstery, heated front seats, and dual-zone automatic climate control. All grades benefit from Hyundai’s generous warranty coverage, including 5 years/60,000 miles bumper-to-bumper, 10 years/100,000 miles powertrain, and 5 years/unlimited miles roadside assistance. With manual transmission, the Base Elantra GT starts at $20,235. Base price for the manual-transmission Sport is $24,135. There are no factory standalone or packaged options for these models. Base grades with automatic transmission have a base price of $21,235 and are available with two option packages. The $1,800 Style Package adds blind-spot/rear cross-traffic alert, pushbutton ignition, dual-zone automatic climate control, power driver’s seat, and heated front seats. You have to get the Style Package to add the $4,300 Tech Package, which includes full LED headlights, power panoramic sunroof, leather upholstery, an electronic parking brake, imbedded GPS navigation, Hyundai’s Blue Link telematics, Infinity-brand audio system, wireless smartphone charging, and ventilated front seats. The Sport automatic starts at $25,235. Its $3,850 Tech Package includes most of the items in the Base model’s package but adds autonomous emergency braking with pedestrian detection, forward-collision warning, automatic high-beam headlights, automatic steering correction to keep you in your lane, and drowsy-driver alert. Despite its lack of driver-assistance features, a manual-transmission Sport is our pick as the best value of this lineup. The Elantra GT’s EPA ratings are near the bottom of the competitive set. Base models rate 23/31/26 mpg city/highway/combined with manual transmission and 24/32/27 with the automatic. Sport versions rate 22/29/25 mpg with the manual and 26/32/28 with the dual-clutch automatic. Our test Sport with manual transmission achieved 29.2 mpg with slightly more highway driving than city use. We hope Hyundai will make driver-assistance features that are only available on loaded GT Sport automatic models available across the entire line. Otherwise, this compact hatchback will probably see few changes until it receives a mid-lifecycle freshening for the 2021 model year.